sweet lime, almond oil and macadamia grains. 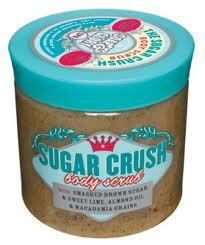 gloriously delicious body scrub Sugar Crush twice a week and the results? Silky smooth flawless skin that feels like new! Try it you will love it! I have bought some more since xmas, all the ones you mentioned plus "hand food" and "heel genius" Love love love them all, just waiting for my hot cloth face cleanser to arrive in post! stay tuned for more S&G!